February | 2013 | Crystal Water Villas Blog - Lake of the Ozarks! St. Patrick’s Day Weekend – Stay At Crownview! 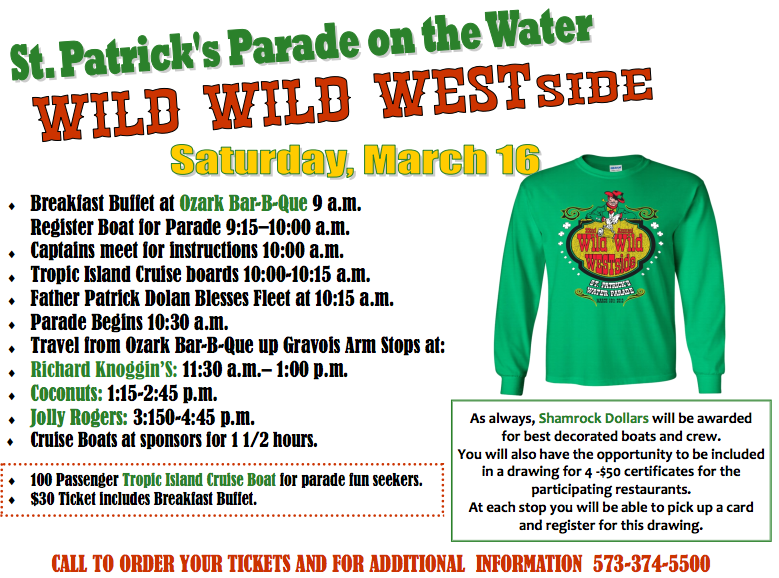 The Lake of the Ozarks West Chamber of Commerce is hosting a Wild Wild West Side Parade on the Water on Saturday, March 16th. If you’re not on the boat, Crown view is an excellent place to view the parade. For the best view, be sure to bring a pair of binoculars! This executive business, family, and/or wedding retreat sits on a private point (7-mile marker) overlooking the main channel and Gravois arm. The remodeled home is two stories, three bedrooms, and two baths. It sleeps up to 9 people, has 3 bedrooms, and 2 bathrooms. It offers guest spectacular panoramic views of the lake, excellent fishing, and an amazing view of the Ozark’s morning sunrise. This “quiet side” retreat is 25-30 minutes away from all the action on the other side of the Lake – Bagnall Dam, Lake Ozarks, and Osage Beach – via the community bridge. CLICK HERE to learn more about Crownview. Each year, brave souls take the plunge into the icy water of the Lake of the Ozarks. All in support of local Special Olympics athletes. If you are interested in support a good cause, please visit the Missouri Special Olympics website. Even if you’re not taking the plunge yourself, go support the cause by attending the plunge this Saturday (February 23rd) at Lake of the Ozarks Public Beach No. 2. Best of the Lake of the Ozarks 2013! Take A Second And Vote! “Best Place to Stay On the Water”! We are honored to be nominated and would appreciate your vote. By voting, you will be entered to win a $200 prize! Hint: We are on page 4, #10 of the survey. After you vote, e-mail Sherry atvacation@crystalwatervillas.com and let her know you voted. We’ll register you for a Designer Floating Air Mattress…see above! *Hurry! You have until February 18th at 5 pm to submit your vote! Traditional St. Patrick’s Day parades are fun, but at the Lake of the Ozarks, we have the luxury of taking really any event to the water! For $30, you’ll get to ride of the Tropic Island Cruise Boat, get a breakfast buffet, and much more! If you’re interested, act now. Tickets are going fast! Call 573-374-5500 – Here is the registration form and full schedule. There’s nothing like it around the globe! The Mardi Gras Pub Crawl at the Lake of the Ozarks is coming up on Saturday, February 16th! With more than 20 local restaurants and bars participating in the event, this is a must-attend if you’re in the area. Great people and a whole lot of Live Music! Lake of the Ozarks Valentine’s Day Flash Deal! Need to spice things up? Are your Valentine’s Day plans still up in the air? Book a stay during Valentine’s Day week and receive a $100 Visa card! You can use that money however you like: A romantic dinner. Dozen of roses (listen up, guys!). Or whatever your heart’s desire. Take a look at our properties and then give us a call at 1-866-273-2169 to book your stay and receive the Vias gift card. It’s really that easy! Throw caution to the wind and take an exciting, last-minute trip together. You’ll be glad you did.